Palazzo Sansedoni, Monte de’ Paschi di Siena, June 18th – July 2nd 2013, Siena. The interactive installation explores perspectives on women’s rights, eliciting individual reflection, triggered by an immersive experience. Patrizia Marti (project coordinator), Marcello Flores, Michele Tittarelli, Ernesto Di Iorio, Iolanda Iacono, Matteo Sirizzotti, Lorenzo Alessandro Megale ‐ Università di Siena. Ambra Trotto (project leader of the Interactive Institute team), Nigel Papworth, Jeroen Peeters, Bjorn Yttergren, Fredrik Nilbrink, Nic True,Daniel Fallman, Kent Lindbergh, Ru Zarin, Andreas Lund ‐ Swedish ICT Interactive Institute, Umeå, Sweden. Caroline Hummels ‐ Eindhoven University of Technology. Through the lens of the personal experience of three women, we look at three fundamental themes: violence, self-determination and emancipation. In article 5 of the Universal Declaration of Human Rights “No one shall be subjected to torture or to cruel, inhuman or degrading treatment or punishment” the theme of violence is exhausted. The themes of emancipation and self-determination are transversally treated in the whole Declaration and constitute two of its leading values. They reach their maximum expression in art. 22, in the claim of rights “indispensible for one’s dignity and the free development of one’s personality”. The point of departure of this exploration are three paintings of the private collection of the Fondazione Monte dei Paschi di Siena. They illustrate three historical characters: Cleopatra (by Marco Pino, XVI century), Lucia from Siracusa (by Maestro dell’Osservanza, XV century) and Maria Maddalena (by Rutilio Manetti). Cleopatra, a Greek queen of Egypt, the last in a line stretching back to Alexander the Great. Hounded and wooed by the Roman Empire for her position and power, she was known for her seductive skills and her ravaging intelligence. Cleopatra supports our narration on the theme of emancipation. Lucia di Siracusa, denounced to the Roman police and prosecuted for her religious beliefs as a revenge for having refused a pretender, was deprived of her free-will, her dignity and condemned to a painful and denigrating death. Lucia di Siracusa supports our narration on the theme of violence and torture. Maria Maddalena, vilified by early Christian history, which confused facts and impeded her to be remembered as a honest human and to be acknowledged as the symbol of knowledge in the Gospels. Maria Maddalena supports our narration on the theme of self-determination. By looking at three paintings, each focused on a well-known female gestalt, in a new manner, this installation aims at playing with and perhaps changing our perspective of these universal issues, tackled from a female perspective. The ambiguity of interpretation, elicited by this interactive experience, connects to the ambiguity of information, to its controversial nature. It offers different points of view and representations and suggests the need for clearer understanding and embodiment of these issues. The information flow reflects both the old and new techniques for imparting, sourcing and consuming information. The narration is accompanied by poems addressing violence, emancipation and self-determination. People entering the space, will be able to move around and explore the installation. The position of the installation’s components, the screens, and their contents will be influenced by the people in the room. The installation “locks” on some of the people entering, allowing them to see, from three special points in the room, one complete painting, out of the fragmented pieces, for a very short amount of time. 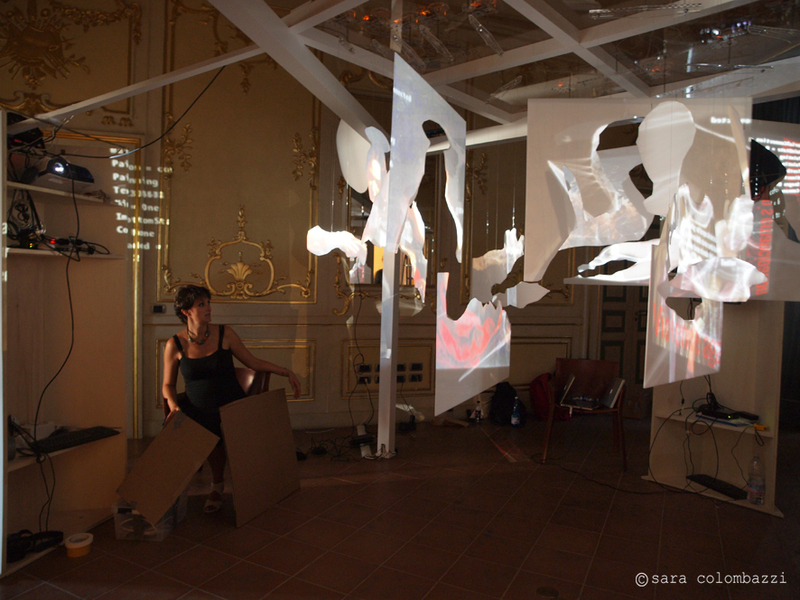 The movement of the installation is not only influenced by the physical presence of people approaching it. The screens are fixed to servomotors whose movement is also influenced by the opinions expressed over internet through social networks (facebook, twitter) and websites discussing the theme of women’s rights. A software crawler monitors how the themes of violence, emancipation and self-determination are debated through posts, news, discussion threads. Depending on the amount of discussions generated over the internet, which are in turn represented as input to the installation, the servomotors and therefore the screens orient themselves. The metaphor of this interaction is that you can contribute to compose an harmonious picture of the complex world of women’s rights, by actually getting close to that world, represented by the installation, and by confronting with the opinions of other people debating the theme world while. Our common effort can help to compose a coherent picture. In the installation, representations of these three painting are fragmented, and float in the space, much as the information we have about their subjects has been fragmented by history and politics and the speed of our world. Set on rotating spindles, these fragments resist attempts by the viewer to capture them as a whole. Thus, the screens only provide a complete view of the paintings at selected times and from specific view points in the room. The installation thus presents a space in which a number of elements float and move. The shape of these elements is based on the contours within the three above-mentioned paintings. These are suspended from a self-standing structure, and the elements are placed at around shoulder height and upwards. On these elements will dynamically show both the original painting and a writhing of visual material presenting news, opinions and statements on the three themes. Some of these elements are able to rotate, activated by servomotors. A unique audio solution provides the viewer with fragments of close whispered narration, lost almost as soon as they are caught. The narrative contents are poems that accompany the whole experience.